This past August, I was given the opportunity to work closely with the Bridges Collection through the continuation of the 3D scanning project. It was my aim to discover a quicker way to scan these artefacts on the computer, and to make them more accessible to the public online. Although it produces excellent results, the previous photogrammetry project was also very time consuming, and so I made it my goal to find something that was more efficient. 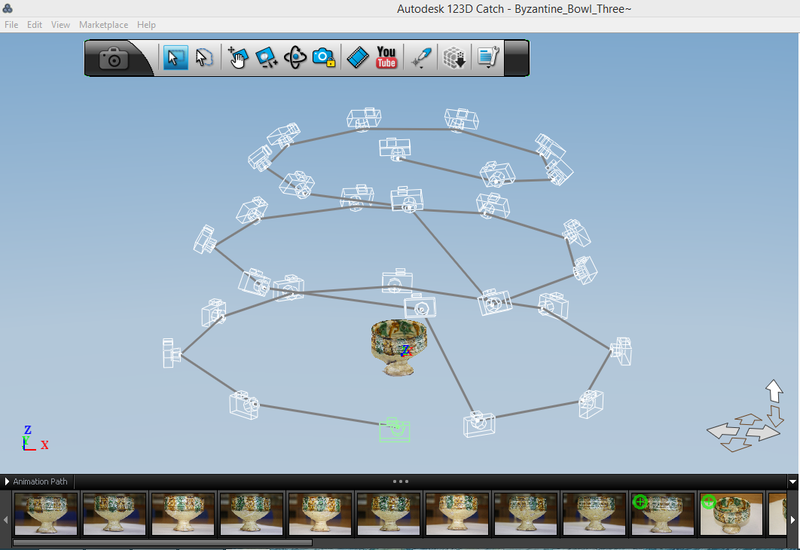 After some research, I decided to look into a simpler version of 3D imaging in the form of 123D Catch. The premise is simple: I simply placed the artefact on a turn table, and took 30-40 pictures of it, rotating the object slightly after each photo. The aim here was to take pictures of the artefact from multiple angles with as many redundancies as possible. 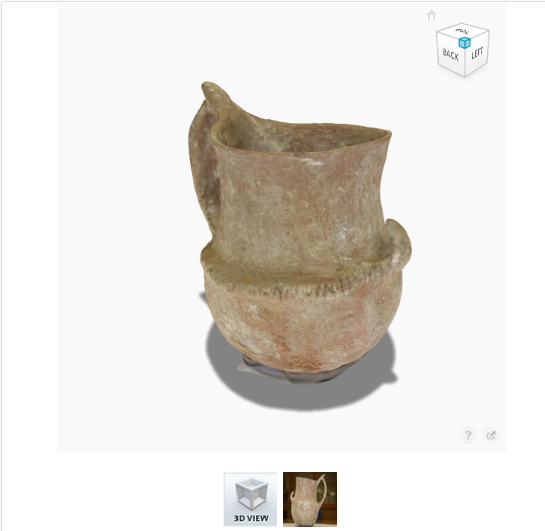 This way, the software in 123D Catch was able to recognize and match corresponding features in each different shot, and be able to piece together a 3D image as soon as you plug your photos into the software. Depending on the amount of photos used, the whole process from the initial pictures to the rendering takes about 20-30 minutes maximum. I would usually take the photos of an object, plug them into the programme, and begin the next artefact while the last was rendering. I used my Canon Rebel to take the pictures, but could have easily have used an iPhone. Beyond establishing another technique of photogrammetry, the primary aim of this project was to allow the collection to be as accessible to as many people as possible. 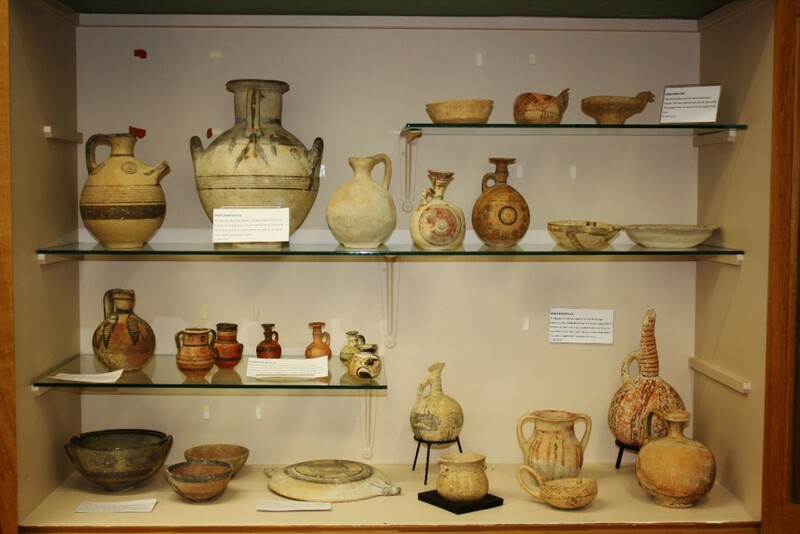 The Bridges Collection is truly a fantastic collection of artefacts that encompasses a significant range of Cyprus’ history. As of now, these treasures lie in a quiet corner of the School of Classics, +-where only a handful of students and visitors have access to them. Out of those even fewer are able to examine them in detail out of the cases. The beauty of 3D modelling and the move to put these resources online is that it makes it not only more accessible to the St Andrews community, but to anyone who has access to the internet and the inclination to learn about it. This project is not yet finished, however. Now that an efficient method of photogrammetry has been established, I am going to work at representing the rest of the collection online. After this is underway, more specific exhibits can be created using this growing archive of images and 3D models. By drawing on this online archive, students can highlight the connections and similarities of this diverse collection beyond their current chronological display. Themes such as domestic life, funerary practices, and manufacturing can highlight hidden aspects to this fascinating and eclectic collection of artefacts. This is an extremely worthwhile project, bringing the St Andrews Bridges Collection into the digital age.